Mr. Jonathan specializes in complex litigation and has significant experience in contract, accounting, and finance disputes. He has represented both buyers and sellers in price disputes over the purchase of real estate, companies, and goods. Utilizing his background and experience in accounting, Mr. Jonathan has successfully represented clients in accounting fraud and working capital disputes. 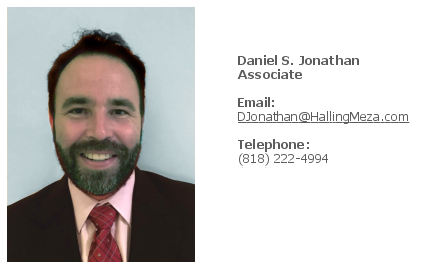 Mr. Jonathan passed the CPA examination in 2005 and was admitted to the California State Bar in 2009. Prior to joining Halling + Meza, Mr. Jonathan was an accountant at Deloitte and later an attorney at the international law firm of Kirkland & Ellis, where he represented Fortune 500 companies. Halling | Meza provides legal expertise and counsel to clients including Fortune 100 companies, nonprofit organizations, REITs, small businesses, and entrepreneurs. Copyright ©2019 HALLING | MEZA LLP All Rights Reserved.